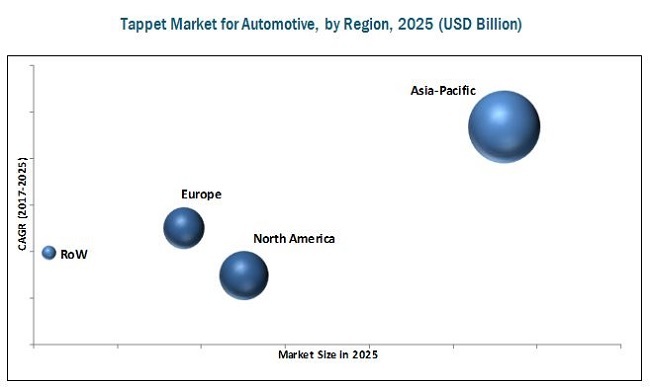 [121 Pages Report] The tappet market for automotive is valued at USD 6.90 Billion in 2016 and is projected to reach USD 10.11 Billion by 2025, growing at a CAGR of 3.36% during the forecast period. The base year for the report is 2016 and the forecast period is 2017 to 2025. The research methodology used in the report involves primary and secondary sources and follows a bottom-up approach for the purpose of data triangulation. The study involves the country-level OEM and model-wise analysis of automotive tappets market. This analysis involves historical trends as well as existing penetrations by country as well as vehicle type. The analysis is projected based on various factors such as growth trends in vehicle production and adoption rate by OEMs, among others. The analysis has been discussed and validated by primary respondents, which include experts from the automotive industry, manufacturers, and suppliers. Secondary sources include associations such as China Association of Automobile Manufacturers (CAAM), International Organization of Motor Vehicle Manufacturers (OICA), European Automobile Manufacturers Association (ACEA), Environmental Protection Agency (EPA), Society of Indian Automobile Manufacturers (SIAM), SAE International, and paid databases and directories such as Factiva. The ecosystem of the tappet market for automotive consists of automotive tappet manufacturers such as Schaeffler (Germany), SKF (Sweden), Eaton (Ireland), Federal-Mogul (US), Otics Corporation (Japan), and NSK (Japan). These manufacturers supply tappets to automotive OEMs such as Nissan (Japan), General Motors (US), Daimler AG (Germany), and others. The tappet market for automotive is projected to grow at a CAGR of 3.36% from 2017 to 2025, to reach a market size of USD 10.11 Billion by 2025. The market growth is primarily driven by an increase in passenger vehicles production. 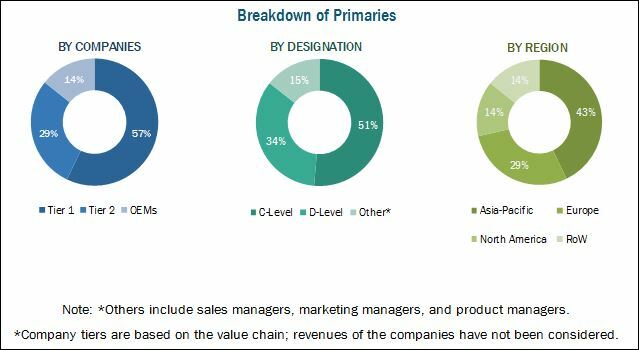 Also, the growth of the commercial vehicles segment, which can be attributed to the improving business environment for fleet operators and a rise in demand from the construction and mining sectors, drives the growth of the automotive tappet market. Roller tappets are estimated to be the fastest growing segment of the global tappet market for automotive. The growing trend of engine downsizing without compromising the performance of the engine is driving the market for roller tappets. The 4–6 cylinder segment is estimated to be the largest segment of the tappets market for automotive, by engine capacity. Stringent emission regulations in several regions and the demand for high-performance vehicles with the smaller engine are the major factors driving the growth of the 4–6 cylinders segment. Luxury passenger cars are estimated to be the fastest growing segment of the tappet market for automotive, by end user type. The growth of this segment can be attributed to a significant number of luxury vehicles in Europe and North America and increasing demand for these vehicles in Asia Pacific owing to increasing purchasing power and demand for more powerful vehicles. Asia Pacific is estimated to dominate the tappet market for automotive, by volume as well as value. The region comprises countries such as China and India, which are witnessing a huge demand for passenger and commercial vehicles. The demand for automotive tappets is directly linked to the vehicle production and consumer demand in this region. Also, favorable government policies for the manufacturers and infrastructural developments have boosted the demand for passenger cars and commercial vehicles, which is further expected to boost the growth of the automotive tappet market in this region. A key factor restraining the growth of the automotive tappet market is the increasing adoption of electric vehicles. Unlike ICE, an electric engine does not require the automotive tappet, as there are no inlet and outlet valves. Several OEMs are focusing on the development of alternative fuel type powertrain technologies to meet the stringent emission regulations set by the government and, more importantly, hold a competitive advantage in the market. Some of the key market players in the automotive tappet market are Schaeffler (Germany), SKF (Sweden), Eaton (Ireland), Federal-Mogul (US), Otics Corporation (Japan), and NSK (Japan). *Details on Business Overview, Product Offered, Recent Developments, SWOT Analysis, MnM View Might Not Be Captured in Case of Unlisted Companies.